Your Uninstaller! Pro provides computer users different way to remove Windows program. This is a legitimate software which should not be hard to remove when you need to. Anyway, if your have trouble with completely uninstalling Your Uninstaller! Pro, here is detailed instruction to teach you how to do so step-by-step. Activate sidebar by dragging the mouse pointer to the bottom right of the screen. Click Setting in the sidebar, then click Control Panel. 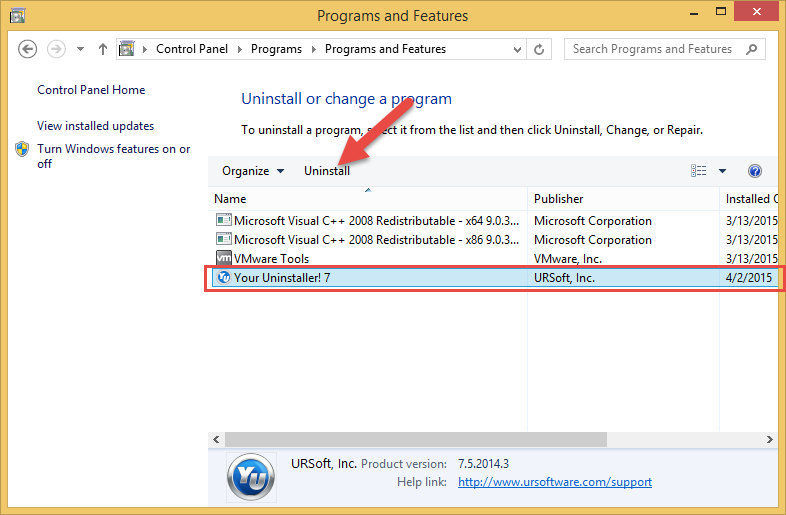 Under the category of Program, click the link of Uninstall a program. The pop-up window contains all program that installed in your PC, you should be able to find Your Uninstaller! Pro in the list, just highlight the program and click Uninstall button. Skip the ad by clicking “No thanks” option to continue the removal. 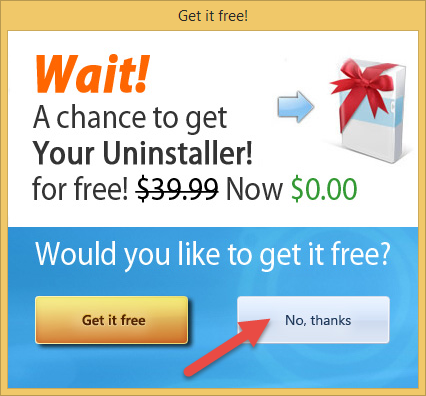 You will receive a pop-up message asking you “Are you sure you want to remove Your Uninstaller! 7 and all of its components?”, just click Yes to start the removal. You will see the message of “Your Uninstaller! 7 was successfully removed from your computer.” after the removal process was done. Click Windows button at the bottom left of the screen, go to Control Panel. 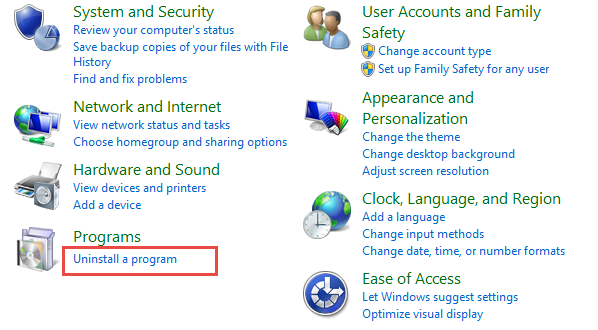 Click Uninstall a program under the category of Program. Locate Your Uninstaller! Pro in the list, right click on it and click Uninstall. Restart your computer after the removal. For those users who are still using Windows XP, simply click Start button at the bottom left, click Control Panel. Open Add/Remove program from Control Panel. 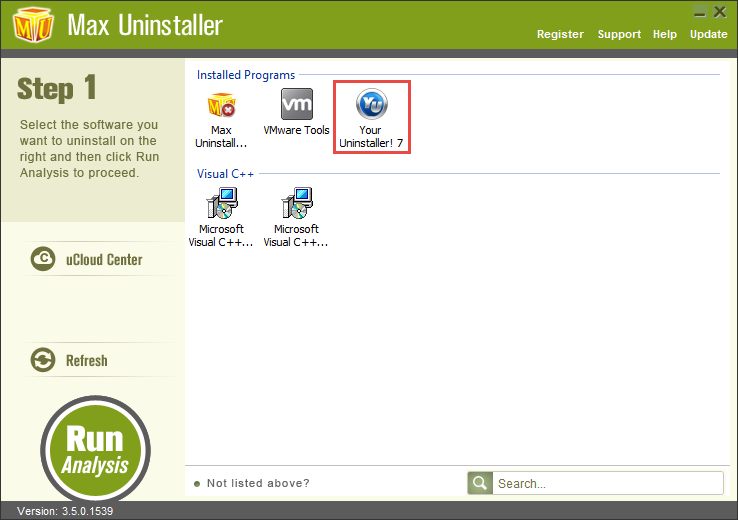 Locate Your Uninstaller! Pro, then click Remove button on the right side. Follow the given instruction to finish the removal, the rest steps is pretty much the same as the processes in both Windows 7 & 8. Press Windows key + R key together to open Run commend box. Type in regedit in the blank and hit OK to open Registry Editor. Navigate the registry editor locate these two folder “HKEY_LOCAL_MACHINE\SOFTWARE” and “HKEY_CURRENT_USER\Software”. Delete any Your Uninstaller! Pro – related entry folder in the above mention location. Once you finish the delete, reboot your PC. Note: You can also go to Edit > Find, enter part of the program name (in this case, you may enter Your Uninstaller), then hit “Find Next” to look for program leftovers and then delete them one by one. 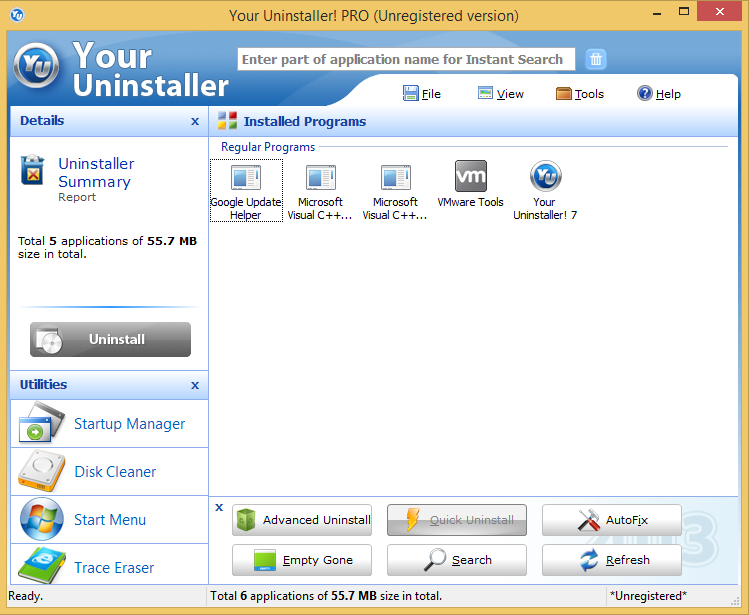 Launch Max Uninstaller, locate and select Your Uninstaller! 7, and click on Run Analysis button. Click Scan Leftover button to check out leftovers of Your Uninstaller! 7 that still persist in your computer. Finally, click the green Delete Leftovers button to delete all found items. OK, now You have successfully remove Your Uninstaller! Pro from your computer! If you have trouble or confusion about the removal process, do feel free to leave your message below, we are glad to help you out.